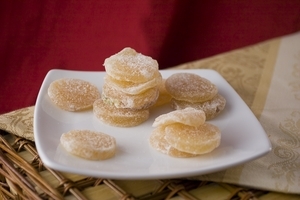 Chewy, spicy and sweet are all superb descriptions for premium Crystallized Ginger imported from Australia and Thailand. A versatile and tasty addition to savory recipes, or as a simply indulgent topping for your favorite ice cream. Ginger has been revered for hundreds of years for its medicinal properties, and it's still used as a medicine in Asia, India and the Middle East. A great digestive aid, ginger is well established as a preventative for stomach upset. 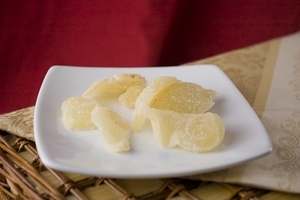 With an ambrosial taste, Crystallized Ginger's health benefits include anti-inflammatory compounds that may even ease the discomfort and pain of arthritis. Aromatic and flavorful, Crystallized Ginger not only gives your immune system a boost, but it is a great source of the nutrients manganese, copper, potassium and magnesium. Try the chewy, golden-hued Premium Australian Ginger Slices made from baby ginger roots, or the spicy Classic Crystallized Thai Ginger. Both provide a perfect mix of the sweet and spicy. Crystallized in natural sugar, our premium Ginger is healthy and delicious. Think of it as a delectable confection that makes a wonderful addition to your favorite baked goods, and a delightful treat to add to cocktails and custards.